It's been a long time since the last edition of my Most Coveted list. Here are 5 things I'm loving right now. 1. Geisha Ink liquid eyeliner ($30; available at BeautyMark or Kiss & Makeup). As far as liquid eyeliners go, Geisha Ink is one that makes me wonder how I ever lived without it. The formula is waterproof, smudge-proof and lasts 24 hours, plus the tip is superfine. You can draw a line as thin as a thread or lay it on thick for a dramatic yet precise cat's eye. 2. Pretty peachy polishes. After a long fall and winter of dark nail colours, I can't get enough of light blush and beige hues. Not only do they complement a lighter spring wardrobe, they're guaranteed not to clash with the colour-blocked ensembles that are so trendy this season. My picks: Sephora by OPI's 'Nonfat Soy Half Caff' (a warm pinkish beige creme) and Butter London's 'Hen Party' (a sheer peach with blue shimmer). 3. 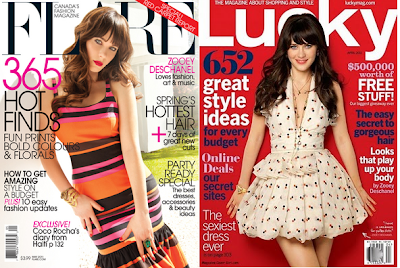 Zooey Deschanel on the cover of FLARE and Lucky. I've loved her since 500 Days of Summer, so it's nice to see one of my favourite style icons gracing two magazine covers within two months. The FLARE cover (shot by Tony Duran) shows Zooey in a high fashion light, while the Lucky cover (shot by Robert Erdmann) captures the quirky Zooey we all know and love. In other news, who else is excited about seeing Your Highness? 4. T. Babaton 'Carter' trench ($250 at Aritzia). A classic trench coat will look good one, five, and ten years from now, so it pays to invest in a nice one. I recently fell in love with the 'Carter' from Aritzia. Single-breasted with a flap that can be buttoned up to the neck or folded down for a deep V neckline, this is a versatile piece that will carry you through spring in style. Plus, the heavy cotton fabrication is more wrinkle-resistant than many of the cheaper trenches I've seen, which means that it'll look crisp and impossibly chic instead of rumpled. 5. You, dear readers! Adjusting to a new job and schedule has been more difficult than expected. I don't have as much time and energy to reply to blog comments, and at times the blogging has become pretty erratic. Thanks for sticking by me during the last couple of months. nice! I've been looking for a waterproof liquid liner. 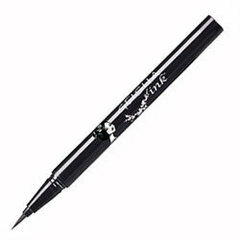 thanks for the recommendation : D lancome's artliner has amazing application but not waterproof so time to retire that. Sounds like there are a few adjustments to routine with your new job - hope it will level off soon and you feel grounded in your new role. Hen Party looks like a nice spring colour. I still love Yummy Mummy. I really wish I stopped by Beautymark when I was in Vancouver. It will be on my hit list for the next time I come to visit. I love Zooey Deschanel. When I first saw her in Elf I was like, who is this girl?! She's fabulous. Zooey looks weird on the cover of Flare. Like too photoshopped? I love Geisha Ink! It's the only eyeliner I use. Have not tried Geisha Ink, but other Jap products with same claim and no luck. My true love is MAC Liquidlast. Will only come off with oil based eyeliner remover. otherwise, it stays all day all night.